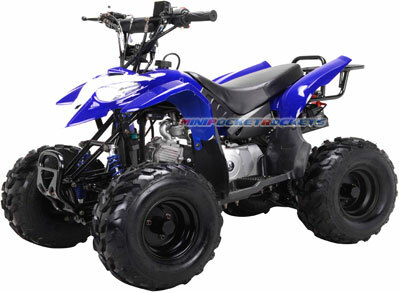 The T-Rex line of Mini ATVs were designed for all-out sport use and racing. Riding on the new Computer Aided Design (CAD) Tubular X-Frame and revised racing suspension geometry, the T-Rex cuts sharper corners while giving the racer the ultimate control on any terrain. Longer travel tube shock absorbers soak up all the bumps without upsetting this Mini ATV's perfect 50/50 weight distribution. Our off-road tuned Honda®-Based 4-Stroke Engine is mated to even more aggressive gearing for top-end speed. Since carrying heavy payloads is not a priority in race-ready Mini ATVs, even the automatic transmission's engagement points have been revised for quicker throttle response. Massive 16" Mudslinger XC All-Terrain Tires offers up the most aggressive setup, designed for full throttle, tail-out traction in even the loosest of dirt. The upgraded hydraulic braking system also features a foot-activated emergency pedal for the shortest stops. Couple those features with a slick aerodynamic impact-resistant body shell and a higher ground clearance and you got yourself a Mini ATV that can take you anywhere you can imagine... fast! Like all of our Mini ATVs, the T-Rex comes with a host of safety features. The adjustable speed governor can be set to limit speeds to as low as 5 mph. In addition to a handlebar mounted engine kill switch, a Remote Controlled Auto Shut-Off transponder can be activated from up to 30+ feet away. Steel skid plates protect vital components underneath, while the Twin Headlights illuminate the trail ahead when day turns to night. Ultra-bright brake and tail lights will alert any vehicles behind you of your intentions. The ZR-X Alternator will keep your waterproof battery full, and the push-button electric start will fire up your ATV effortlessly every time. We've even thrown in a small storage rack so that you can take some essentials with you as you explore the woods. The T-Rex Mini ATVs are the best handling All Terrain Vehicles in its class. Just fill-up some gas, attach the wheels, connect the battery and you're ready to race! EPA APPROVED - OUR MINI ATVS ARE EPA APPROVED, LEGAL TO REGISTER IN ALL 50 STATES! Included Free with T-Rex Mini ATVs: Tools, Ignition Keys (2), Charger, Remote Control, Registration Papers / Title of Ownership, Owner's Manual, Informational DVD and our free extended warranty.